Home English Creative Writing Competition by IDIA, Pune: Winners Announced! Creative Writing Competition by IDIA, Pune: Winners Announced! The first prize is to Onjula Chatterjee, ILS Law College, Pune. The second prize is to Onkar Date, MITADT School of Bioengineering Sciences and Research. 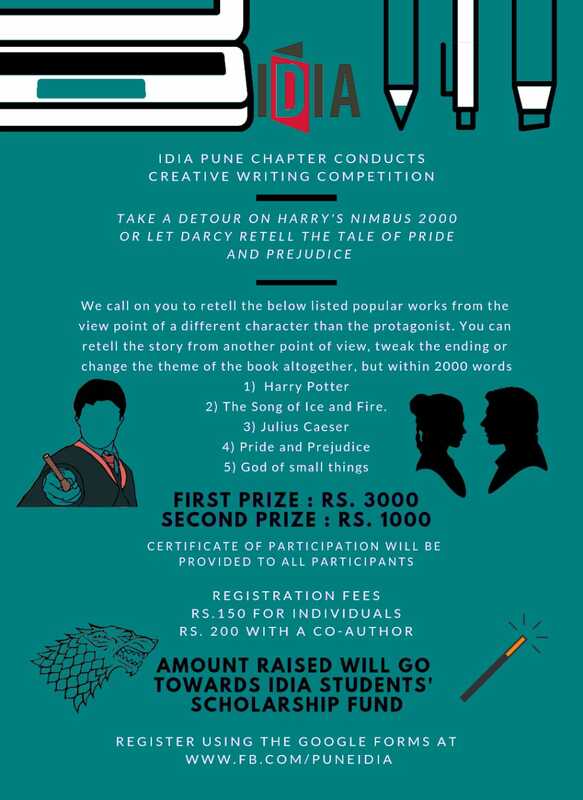 IDIA Pune Chapter is conducting a Creative Writing Competition. Participants are invited to retell the below listed popular works from the viewpoint of a different character than the protagonist. You can retell the story from another point of view, tweak the ending or change the theme of the book altogether, but within 2000 words. Registration Fee is ₹ 150 for individuals and ₹ 200 with a co-author. Note: The amount raised will go towards IDIA Students’ Scholarship Fund. Register online at this Google form. Entries must be submitted by 28th February 2019, 11:59 PM via an e-mail to idialawpune@gmail.com. Submissions made after the deadline shall be disqualified from the competition. The detailed submission guidelines are given here. Certification of participation will be provided to all participants. In case of any Queries, please mail us on idialawpune@gmail.com with the subject “Queries – Creative writing competition” or contact us on the following contact numbers.